When Sweden lost its position as a great power in the early eighteenth century, Russian pressure on Finland increased, and Russia conquered Finland in the 1808-1809 war with Sweden. During the Swedish period, Finland was merely a group of provinces and not a national entity. Finland was governed from Stockholm, the capital of the Finnish provinces at that time. But when Finland was joined to Russia in 1809 it became an autonomous grand duchy. The grand duke was the Russian emperor, whose representative in Finland was the governor general. Finland's highest governing body was the senate, whose members were Finns. Matters pertaining to Finland were presented to the emperor in St Petersburg by the Finnish Minister Secretary of State. This meant that the administration of Finland was handled directly by the emperor and the Russian authorities were therefore unable to interfere. The enlightened Russian Emperor Alexander I, who was grand duke of Finland in 1809-1825, gave Finland extensive autonomy, thereby creating the Finnish state. The Lutheran Church retained its position in Finland, and so did Swedish as the official language of the country. In 1812, Helsinki was made the capital of Finland, and the University, which had been founded in Turku in 1640, was moved to Helsinki in 1828. The Finnish national movement gained momentum during the Russian period. The Finnish national epic, the Kalevala, created by Elias Lönnrot, was published in 1835. J V Snellman (1806-1881), who was a senator and professor at the University of Helsinki during the reign of Alexander II in 1855-1881, worked to promote the Finnish language and to make it an official language alongside Swedish. The Language Decree issued in 1863 by Alexander II marked the beginning of the process through which Finnish became an official administrative language. Although only one seventh of the Finnish population spoke Swedish as its first language, Swedish retained its dominant position until the beginning of the twentieth century. During the reign of Alexander Ill (1881-1894) and particularly of Nicholas II (1894-1917), nationalist circles in Russia gained increased influence. The Grand Duchy of Finland, part of the Russian empire but enjoying extensive privileges, had long been a sore point to Russian chauvinists. Finland was a state within a state, with its own senate and its own Diet, its own local officials, legislation, army, money (the mark) and postage stamps. And to top it all off, Finland was separated from the empire by an official border. The obliteration of 'Finnish separatism', a policy also known as Russification, started during the 'first era of oppression' (1899-1905) and continued during the second era (1909-1917). 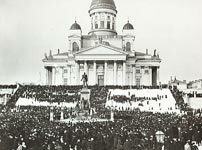 The 1905 Revolution in Russia gave Finland a short breathing space, while a new legislative body to replace the old Estates was created in 1906. At that time this was the most radical parliamentary reform in Europe, because Finland moved in one bound from a four estate diet to a unicameral parliament and universal suffrage. Finnish women were the first in Europe to gain the right to vote in parliamentary elections. Text copyright © Terhi Jääskeläinen & Seppo Zetterberg. An original feature for the History Files.